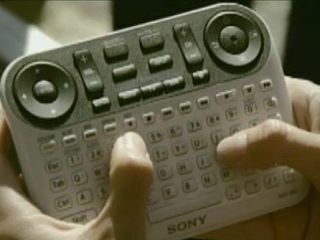 Sony's controller for its Google TV tie-in has been shown off on US television, and could be a harbinger for the kinds of remotes that we will see arriving in the UK imminently. With the likes of YouView arriving in the UK and likely to spark huge interest in IPTV, and Sky and Virgin Media both offering more comprehensive video on demand the need for an evolved remote control has become of paramount importance. That's because searching for programmes will be a key way for people to find their televisions, and traditional remotes have never been particularly handy for offering this functionality. Google TV – which for the time being is arriving only in the US – will also be heavily dependant on typing, and Sony's answer to this was shown off on ABC Nightline's Google TV special in the US overnight. The remote features not one but two directional pads and a full QWERTY keyboard – and probably resembles a console gaming controller more than a traditional remote. With Logitech set to show off their latest kit for Google TV later in the day, it's certainly a good day if you're a remote control fetishist.